The ICF Canoe Freestyle World Championships were hosted in the Nantahala Gorge September 2013. It was an amazing event with Athletes from 30 countries participating. Adventurous Fast Rivers This family owned and operated company provides personal and knowledgeable service for all whitewater activities; from family outings to high-performance adventures. Services include group discounts, privately guided, guide assisted or unguided rafting and boating trips. Bryson City Outdoors Stand-up Paddle Boarding on Fontana Lake in addition to a wide variety of outdoor activities. Carolina Outfitters Friendly, experienced and certified guides for guide assisted raft trips on the river or you may choose to go non-guided. 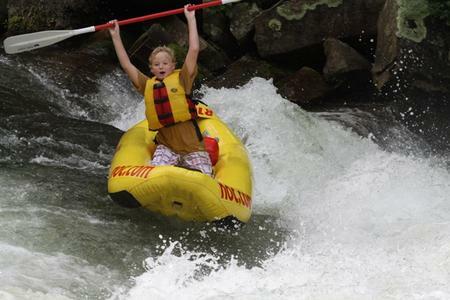 Get a 2nd trip down the Nantahala on the same day for 1/2 price! The entire staff is very friendly and knowledgeable. Endless River Adventures Specializing in Whitewater Rafting, Kayaking, and International Trips. Their commitment – we are not big, we are good; a small giant in the industry with quality and value a priority. Enjoy the personal service! Nantahala Outdoor Center Established in 1972, NOC specializes in extraordinary outdoor recreation activities for you and your family including rafting, world-class paddling and canoe instruction, hiking, biking, zip line adventures and Guided Fontana Lake Tours. NOC OFFERS OUR GUESTS A 10% RAFTING DISCOUNT. Rolling Thunder River Company Over 25 years experience in whitewater rafting on the Ocoee River and the Nantahala River. Whether you are a novice, an experienced paddler, young or simply young at heart, they have a rafting trip that’s right for you. Tubing on Deep Creek A fun activity for all ages – whitewater tubing, waterfalls, picnic area, hiking trails, just 2 miles from Bryson City. Young Harris Watersports Offers watercraft rentals including Kayaks, Pontoon Boats, Jet Ski’s and Motor Boats. They will deliver to Lake Nantahala or Lake Fontana. They offer our guests a 10% discount on rentals. Wildwater Rafting Fully guided, guide assisted and rental trips available. A family-owned business since 1971. Offers Raft ‘N Rail excursions which combines a scenic rail trip with beginning whitewater rafting. They also offer awesome Jeep tours and Canopy/Zip Line Tours. Call 866-319-8870. A new app for iPhone and Android gives hikers a guide to more than 300 hikes in the mountains of Western North Carolina. The hike descriptions include a map and driving directions to the trailhead, elevation gain, distance, trail highlights and a trail map. Look for Great Hikes of the Southern Appalachians on either the Apple App Store or the Google Play Store. Appalachian Trail A 2,160 mile foot trail along the ridge crests and across the major valleys of the Appalachia Mountains from Katahdin in the central Maine wilderness to Springer Mountain in a designated wilderness area in north Georgia. The trail is 8 miles from the Lodge. Bartram Trail The North Carolina Bartram Trail, blazed in yellow, crosses over some of the most scenic mountains of the state, with many side trails, blazed in blue, leading to views of the Blue Ridge and the Smokies. Trail is within walking distance of the Lodge. Bryson City Outdoors One stop shopping to enjoy the outdoors from Adventure Guides to Stand-up Paddle Boarding on Fontana Lake. If it pertains to the outdoors, these guys can help you maximize your fun. Nantahala Outdoor Center The name says it all – numerous outdoor activities available through NOC – hiking, biking, alpine climbing, etc. Bike rentals also available. Tsali Recreation Area A mecca for mountain bikers and horseback riders. Suited for hikers, mountain bikers, and horseback riders, the 4-loop system offers a variety of landscapes. Biltmore Estate We offer discount vouchers for admission. Located in Asheville – about 1.5 hours from the Lodge. Plan to spend the day! The 250 room mansion built by George Vanderbilt in 1895 is a must see and we highly recommend the Audio Tour. Antler Hill Village & Winery is a casual place to explore farm life, tour the Winery (and sample their wine) and visit the Biltmore Legacy Exhibits. Stop by the Outdoor Adventure Center to learn how you can enjoy their 8000 acre backyard – bike rentals and trails, guided walking tours, carriage rides, segway tours, river trips, fly fishing, sporting clays and so much more! Calaboose Cellars & Andrews Brewing Company Enjoy a visit to the smallest free standing complete winery and brewery in America, located in a beautiful valley. Live music is frequently offered. Canopy Tours by Wildwater Rafting – a three-hour experience gives you over 1/2 mile of air time with 3 sky bridges and 5 transfer bridges. More than a zip line ride, the Nantahala Gorge Canopy Tours takes you through multiple ecosystems, past hemlocks, into hardwoods, and through a deciduous forest. NOC Zip Line Adventure Park – soar over 550′ through the air on the Wesser Zip, then take on a multi-level challenge course as high as 60′ above the forest floor. Each level features new obstacles: wobbly sky bridges, confusing spider webs, nerve racking tight ropes and more exciting ziplining. With these options you can pick and choose your challenges based on your abilities. Cherokee Indian Reservation is the home of the Easterm Band of Cherokee Indians. Don’t miss Oconoluftee Indian Village, the Indian Museum, Unto These Hills and the Qualla Arts and Craft Gallery. The Island Park is a wonderful place to enjoy a picnic and play in the shallow water that flows through the park. Clingmans Dome is the highest point along the Appalachian Trail and provides a 360° view of the surrounding mountains rising 6,643 feet above sea level. Fontana Lake and Dam Located 35 miles West of Bryson City, is the highest dam east of the Rockies. Towering 480 feet in height this dam backs water for 30 miles and provides a major source of energy. Great Smoky Mountains National Park Established in 1934 covering 520,408 acres of land with heights ranging from 840 feet at Abrams Creek to 6,643 feet at Clingmans Dome. Don’t miss these areas of the park: Oconaluftee Visitors Center, Mountain Farm Museum, Deep Creek, The Road to Nowhere, Fontana Lake North Shore, Mingus Mill and Cataloochee Valley. Great Smoky Mountains Railway With the romance and mystique of an era gone by, guests on board will enjoy scenic train journeys across fertile valleys, into tunnels and through river gorges. John C. Campbell Folk School Located in scenic Brasstown since 1925, the Folk School offers year-round weeklong and weekend classes for adults in craft, art, music, dance, cooking, gardening, nature studies, photography and writing. You may enjoy visiting their craft shop, or participate in the Tuesday night Contra and Square Dances. Joyce Kilmer Memorial Forest A tribute to a hero whose poem “Trees” inspired millions. A walk through Joyce Kilmer Memorial Forest is a journey back in time through a magnificent forest with towering trees as old as 400 years. Some enormous yellow-poplars are over 20 feet in circumference and stand 100 feet tall. The floor is carpeted with a garden of wildflowers, ferns, and moss-covered logs from fallen giants. Nantahala National Forest lies in the mountains and valleys with elevations as high as 5,800 feet at Lone Bald in Jackson County to a low 1,200 feet in Cherokee County along the Tusquitee River. Nantahala Outdoor Center Open Year Round – restaurants, outfitters store, general store, bike rentals and much more! Stecoah Valley Center located in the village of Stecoah on Hwy 28 N between Bryson City and Fontana Dam. Several studios, galleries and shops open daily with special events offered on a regular basis. It’s a wonderful place to view the work of local artists and craftsmen. Wildwater Jeep Tours An adventurous way to see the beauty of Western North Carolina. Blue Ridge Parkway is 469 miles of scenic roadway that connects the Shenandoah National Park in Virginia with the Great Smoky Mountains National Park in North Carolina and Tennessee. Cherohala Skyway Drive above the clouds. Winding up and over 5,400 foot mountains for 15 miles in North Carolina and descending another 21 miles into the deeply forested backcountry of Tennessee. The road crosses through the Cherokee and Nantahala National Forests thus the name “Chero…hala”. The Skyway is becoming well known in motorcycling and sportscar circles for its long, sweeping corners and scenic views. Deals Gap / Tail of the Dragon World-famous among motorcyclists and sports car drivers, for its eleven-mile section with 318 continuous curves. Mountain Waters Scenic Byway takes you from Highlands to Fontana Lake. The Byway follows U.S. 64, old U.S. 64, Wayah Road, and U.S. 19. Approximately 61 miles of nationally-recognized byway winds through southern Appalachian hardwood forests, by numerous waterfalls and lakes and through two river gorges. Road to Nowhere The Road to Nowhere (Lakeview Drive) is a beautiful drive or strenuous bike ride – particularly in the Fall. It provides an overlook of Fontana Lake and access to a number of hiking trails. Noland Creek Trail is about a half-mile before the tunnel at the end of the road. Walking through the tunnel takes you to Goldmine Loop, Forney Creek, Lakeshore Trail and other connecting trails. If you plan to walk through the tunnel take along a flashlight. And be aware horseback riders use the tunnel as well. 711 Forest Service Road is a very scenic loop off of Wayah Road. Excellent high elevation views. Cherokee Ruby Mine a natural and unsalted mine in the beautiful Cowee Valley in Franklin. This is one of the last native gemstone only mines open to the public. Smokemont Riding Stables – offers a safe, fun, family friendly horseback riding experience within the Great Smoky Mountains National Park. The natural riding trails feature beautiful wooded scenery, native flora and fauna and mountain streams and waterfalls. We recommend the 2.5 hour Waterfall Ride.